Tony will join Rocksport radio’s ‘Just the Juniors‘ show this Friday at 8pm ahead of Saturday’s Scottish Cup tie against Rossvale. You can tune in over on Rocksport’s website. Following on from the announcement of the David Gormley signing, we’ve got some updates from Tony about some departures and the squad going forward. Martin McGoldrick has left the club after a recent career move has led to the defender moving to the United Arab Emirates. “I think people will understand that this is disappointing news, as signing Goldie in the summer was a major coup for the club. To be totally fair to Martin, he’s kept the management team informed throughout the process, so it hasn’t come as a surprise and its allowed us to put a contingency in place. I respect the fact that this is an excellent opportunity for Martin and his family, and he’s right to put those things first. As a matter of fact, Martin has personally refunded the transfer fee Pollok paid for him to the club. Martin’s a modest guy, and he’d probably rather that was kept quiet, but I think its important that people know what a class act he is. Needless to say, we wish Martin and his family well on their big move”. Another figure leaving Pollok is central defender Ross McCabe, who has signed for Cumbernauld United. One more player who is moving to pastures new is Nicky Prentice. Nicky signed in the summer from Kilsyth Rangers; however a change of work commitments have meant that he has been unable to get to Pollok training sessions in past 6 weeks and as such the club accepted an offer from Bo’ness Utd to move on. One final update relates to Colin Williamson. Colin hasn’t featured at all so far this season, after heroically playing through injury for the second half of last season. A recent scan on Colin’s groin and abductor injury has shown no need for surgery and can be treated normally. At the moment there is no time frame for return, but the diagnosis has been positive. “Colin is a big player for us, and he’s been badly missed in midfield. I’m really glad for Colin that he won’t require to go under the knife, but I guess no-one would mind me being a wee bit selfish and saying that I’m glad it won’t be too much longer before I’m able to put Colin back out onto the field in a Pollok shirt. “In terms of team and squad building, I’ve been delighted at the group of players we have at our disposal. Since the start of the season the players have been a great group to work with and in recent weeks and months, there have been real demonstrable signs of them coming together as a real team, great togetherness , will to win, wanting to play and do well for Pollok fans and themselves. At the start of the season, our sole intention was to build a really strong squad and let things develop. 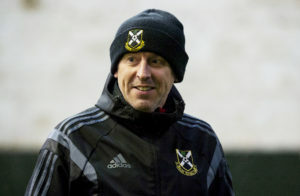 Having taking time to assess the group and the challenges ahead we took positive decisions to improve the quality in the group as the season has progressed by bringing in the likes of Gormley, Wharton and McGregor who have great quality and experience for our predominantly young squad of players. Now we are very happy with the shape and size, strength, competition, quality and importantly, balance of players within our squad. Pollok Football Club are delighted to announce the loan signing of Bryan Wharton from Queens Park. 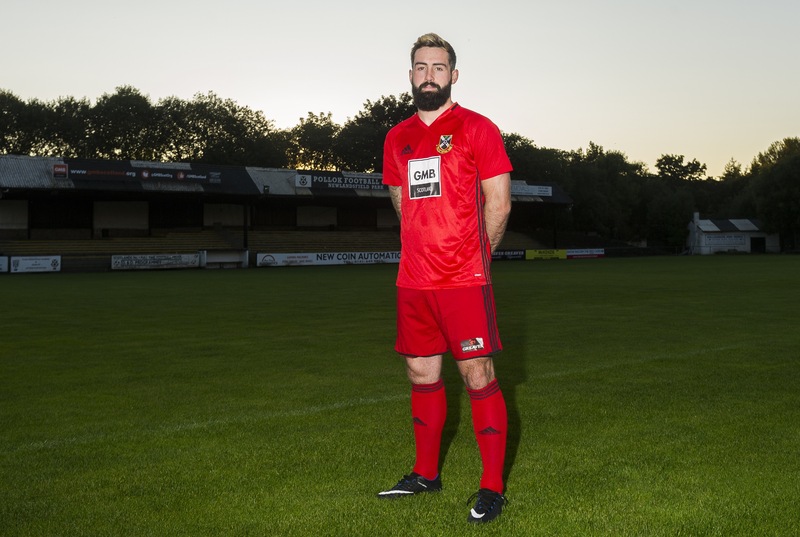 The 27-year-old defender, who was part of Tony McInally’s Scottish Junior Cup winning side at Shotts Bon Accord modelled the club’s new away kit for the next two seasons. 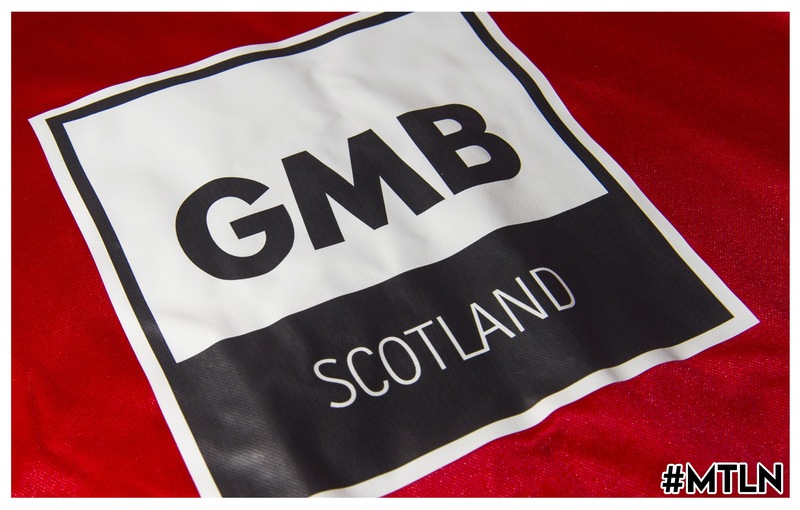 We also welcome new kit sponsors GMB Scotland. GMB works to improve the pay and conditions of GMB members in their workplace with over 600,000 members across the UK. Bryan spent three seasons at our Southside neighbours making 96 appearances and scoring 7 times. 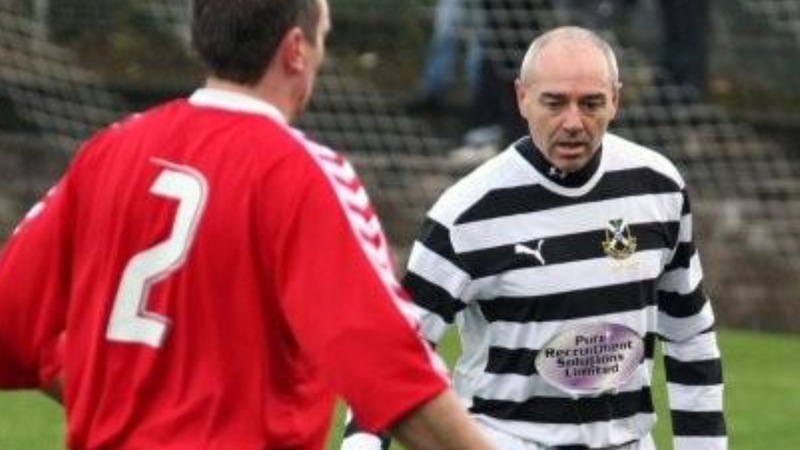 Wharton follows his father, Peter (pictured playing for Pollok in the annual legends tournament), in joining the Southsiders. Peter played in the black and white between 1985 and 1989. Pollok Football Club is delighted this evening to announce the signing of Martin McGoldrick. 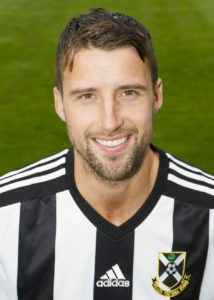 McGoldrick, an accomplished central defender, joins the club from Auchinleck Talbot, where he has played for the last seven seasons. Tony McInally was effusive in his praise for the player: “I’m absolutely delighted to have secured the services of a top-class central defender in Martin. Along with Bryan Young, he has been a pivotal member of a very successful Auchinleck Talbot team in recent times.